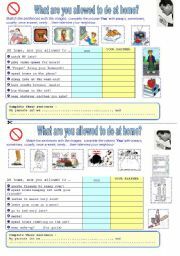 A worksheet to introduce or practise There is/there are with Some/any - I found this image in a children´s magazine a long time ago. 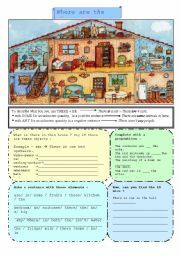 I love it because it´s nice to study vocabulary and there are 10 mice hidden in the house. 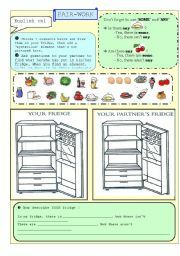 A pair-work I did with my students, it makes them use some and any in questions and answers on the food items they put in ´their´ fridge. Finding the 7 elements is very easy so I let them put another ´mysterious´ element, which is what they preferred. A simple image of a house that students have to label. This is the second worksheet I made with this image. In the end you can ask the students to find the 10 mice hidden in the rooms. PAIR-WORK - what do you have to do at home? 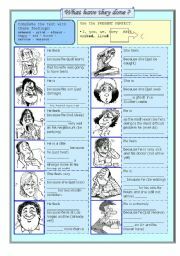 A worksheet to practise the present perfect and review feelings (ashamed, proud, furious, worried, anxious...). Students must find the correct feeling for each image then write the given verb in the present perfect. 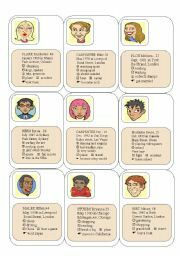 Cards with personal information for oral work. PAIR-WORK - what are you allowed to do at home? This is a ppt I used to provoke comments and discussions about these events. The questions are simple, the images made the children react. 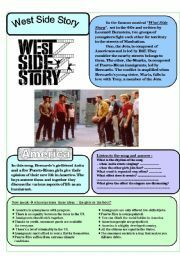 It worked well with my students, hope it can be useful to you! A ppt to discuss what students shouldn´t do in class, and to elicit sentences with ´Don´t´. 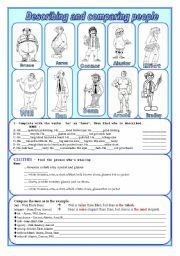 It´s aimed at young students and can be followed by a game in which one student acts as the teacher and the rest (in turn) mime the actions seen in the powerpoint. 14 slides with images to elicit sentences with CAN/CAN´T and ´HAVE GOT´: for ex "He can read because he has got a light" or "He can´t open the window because he is too small"